Rapid planning requires extensive training in the techniques and procedures associated with R2P2. R2P2 requires standardized, detailed, parallel, and concurrent command and staff actions using Standard Operating Procedures (SOPs) that are understood by all members of the unit. Established SOPs for potential mission profiles must include such details as standardized task organizations and equipment density lists to facilitate execution in a time sensitive environment. Upon receipt of a warning, alert, or execute order, a Crisis Action Team (CAT) is assembled to commence initial staff orientation, problem framing, determine information requirements, and identify the commanders guidance for COA development. The CAT meets in the LFOC planning room. The CAT will accomplish its tasks within the first hour. Once adjourned from the CAT, the Mission Commander—supported by select MAGTF/PHIBRON staff members—develops COAs. COAs include phases, a timeline, a task organization, landing beaches and zones, concept of fires, major end items/equipment, a recommended H/L-hour and advantages and disadvantages for each COA. Typically, the designated Mission Commander takes the lead in developing three COAs. The MAGTF COA planning team has one hour to complete COA development. At the two-hour mark, the Battle Staff convenes in the Wardroom for COA consideration and decision. During this time, the COAs are briefed, operational or intelligence updates provided as required, information requirements and rules of engagement are updated, staff estimates of supportability are conducted and the COA is selected or modified. Once selected, the MEU and PHIBRON Commander’s guidance is issued for detailed planning, and a planning order is issued when time permits. In the following two hours, the MSE staffs in coordination with their PHIBRON counterparts conduct concurrent, parallel, and detailed planning while small unit leaders prepare for the mission. Additionally, immediately following the COA Decision (at approximately the two hour and 30 minute mark), the Reconnaissance and Surveillance (R&S) CONOPS Brief is presented by the R&S Leader to the CAT. Simultaneously, all members of the staff who have any responsibility in the execution or conduct of the mission are preparing the Confirmation Brief. As detailed planning and Confirmation Brief preparation continues, MEU staff members prepare the Concept of Operations message and submit it to higher headquarters. At the four hour mark, the CAT convenes for the R&S Confirmation Brief. Following the R&S Confirmation Brief the respective staffs and essential personnel gather in the Wardroom for the mission confirmation brief. One hour is the goal for the Confirmation Brief; it is not unusual to have over 25 briefers and over 100 slides of information. In order to keep the brief at one hour, known SOPs are critical to allow many items to be briefed by exception. The final step is command and staff supervision. During this hour all energy is focused on the unit preparing to execute the mission. Commanders may meet, if necessary, for final coordination. Final inspections and test firing of weapon are conducted, aircraft are spotted, vehicles are prepared, Marines are staged in the final staging area, manifests are confirmed, and communications checks if possible. If rapid planning is to be successful, both mission planning and preparation requirements are conducted concurrently. The speed with which a unit can plan an operation varies with the complexity of the mission, the experience of the commander and the staff, and METT-T factors. The R2P2 was developed to enable the MEU to plan and commence execution of certain tasks within six hours. 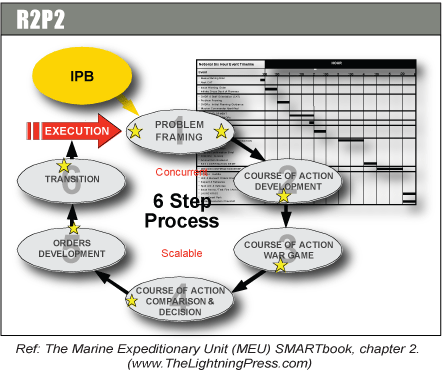 Read more about the marine corps planning process (MCPP) and the rapid response planning process (R2P2) in chapter 2 of “MEU2: The Marine Expeditionary Unit SMARTbook, 2nd Ed. (Guide to Battle Staff Operations & the Rapid Response Planning Process)” by The Lightning Press. Download a free PDF sample and learn more at: MEU2: The Marine Expeditionary Unit SMARTbook, 2nd Ed. (Guide to Battle Staff Operations & the Rapid Response Planning Process).